Associated Companies — Alghanah Group W.L.L. Alghanah Group WLL holds partial ownership in the following associated companies. This diversification of interests has enabled the company to grow in the right direction, while keeping a look out for newer opportunities in sectors associated to civil contracting. 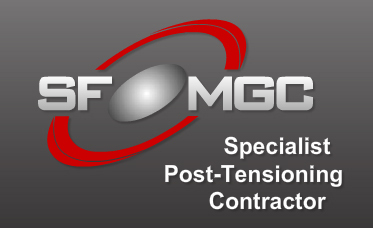 Established in the year 1998, SF- MGC has grown to be a successful specialist contractor in various parts of Asia and The Middle East. They have a strong presence in Malaysia, Abu Dhabi, and are well known for their quality contracting works. They are highly revered in the industry for their pioneering works in the field of Post- Tensioning. Their team of highly experienced and knowledgeable engineers and technicians ensure that their construction engineering products are structurally sound with an even distribution of weight. They use advanced technology and the latest technical aspects that enables them to take on new challenges head on. One of the major players in the real estate markets in The Kingdom of Bahrain, Alghanah Properties primarily deals in buying and selling of lucrative commercial and residential properties in the country. Having witnessed the growth of the real estate in the country at a close quarters, they are at home in finding the right land/ property ventures that suit the specific requirements of their clients. With a primary aim of maximising the value of the property they deal in, they ensure profits for the investors, dealers and developers. Established in the year 2010, House ME has been providing custom property and real estate services in Bahrain. They have a strong team of agents who help their clients to search and choose the right investment properties in the country. Their primary goal is to make the process of providing a positive experience for both the buyers and sellers. Fueled by an incredible vision and incredible resources, they are well equipped to provide personalized services. They make home and property ownership an easy, and profitable affair. Bahrain Concept Trading primarily deals with home accessories, specifically aluminium windows and door fittings. They are one of the authorised dealers of some of the best manufacturers in the world, including FAPIM- Italy’s leading manufacturer of aluminium window and door furnishings. All their products are tested for competency and quality before they are inducted into the markets. All of their products they deal in are specifically designed to meet the necessary safety and quality requirements of the Bahraini markets. Their wide range of products spoils their clients for choice. Apart from being extremely durable and reliable, their products are also stylish and are known to sport a contemporary look. 2019 Copyright © Alghanah Group W.L.L | All Rights Reserved.